In the spring of 2015 I upgraded my imaging equipment to include a C14 XLT and CGE Pro mount. I had been observing the excellent planet images being posted on the internet using Celestron 14" telescopes and decided after a long deliberation to give one a try. I decided to buy a CGE Pro mount which is well matched for this OTA's weight and was within my budget. I bought both the scope and mount used on Astromart and have not been disappointed. I added an Optec TCF-Si motorized focuser to complete the system. I had to modify the wheelerbars that I had been using for my 12" LX200GPS to fit the smaller tripod footprint of the CGE Pro mount. In the fall of 2015 I updated my laptop to a mid-2012 MacBook Pro with USB 3 ports and 256 GB SSD. I added an external USB 3 500GB SSD to accommodate the high speed data captures from my new ASI174MM USB 3 camera. I installed Windows 7 Pro 64 on this system to accommodate the Windows based software. 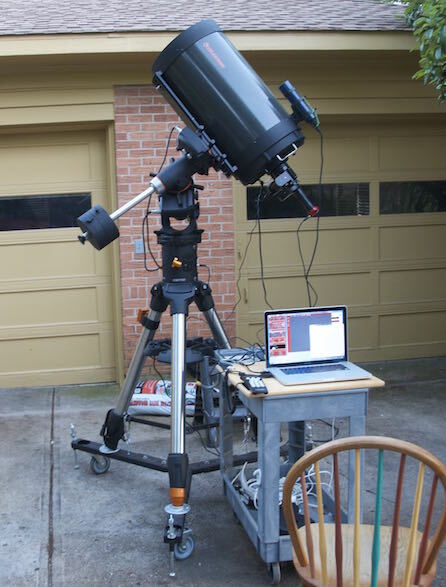 I can roll the equipment out of the garage and onto my driveway and setup quickly for a few hours of imaging when conditions are good for planetary imaging. I have glued large washers to the driveway to help reposition the scope in the same location each night. This scope, a 12" LX200GPS, requires at least 2 hr to reach ambient temp. after being removed from the garage. My laptop is a 2 Ghz Core 2 Duo, 4GB, 500 Gbyte Apple MacBook Pro running Windows 7 via Bootcamp or Mac OS X (Lion) in native mode. The ladder is to allow access to the collimation nobs. The scope is mounted on Wheeley Bars. The Meade SuperWedge has been extensively modified to better support alignment and tracking. My current camera for Lunar and Planetary imaging is a ASI174MM USB 3.0 camera manufactured by ZWO. Previously I have used an ASI120MM and Flea3 camera manufactured by Point Grey. The ASI174MM camera is monochrome. I have an manual Orion 5 position filter wheel that I use with this camera. I have Chroma Technology L-RGB filters. I also have an Astronomik Planet IR Pro 742 filter that I use with this setup. I have a 2.5x TeleVue Barlow that I usually use with this camera. Depending on object brightness, filters used and ROI selected I am able to run this camera at 200 fps and higher. I use FireCapture software with this camera for image acquisition. I utilize AutoStakkert 2, RegiStax, WinJupos, PhotoShop and Topaz for planetary image processing. My current camera for deep sky imaging is an SBIG ST-8XME camera. I have a CFW-8a and AO-8 that I also use with this camera. This combination allows me to take 10 minute sub exposures at F10 with my Meade LX200GPS. The AO-8 performs fast guiding (up to 10 corrections/sec) to overcome the guide errors that remain after PEC has been applied to the Meade Mount. I utilize CCDSoft to control this equipment for image acquisition. I use FocusMax for automated focusing using the standard Meade focuser. I utilize PemPro for PEC training, backlash characterization and drift alignment. I utilize CCDStack for image calibration and processing. I use PhotoShop CS5 for final image touchup. I have several F6.3 focal reducers that I have not been able to work to my satisfaction with this equipment. 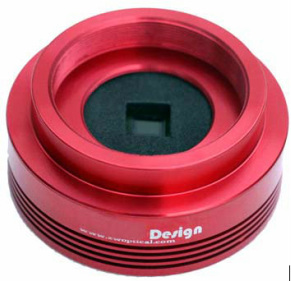 I have a Hotech self-centering adapter (SCA) that I use to interface the camera/filter wheel/adaptive optics units to the focuser. I have found the SCA to significantly reduce the flexure in my optical train. All of my imaging thus far has been done from the driveway of my home near the center of Dallas Texas. The light pollution map on the left is from the Clear Sky Clock for Dallas. My location on this map is well within the white area in the center. I have measured the sky brightness with my CCD and gotten a figure of 16.1 magnitude per square arc second. These conditions do not adversely affect my lunar and planetary imaging. These conditions limit my Exoplanet light curve efforts to relatively bright stars with large magnitude deltas. Even with this limitation there are numerous targets. Deep sky imaging is severely impacted. Attempts to capture color images of faint galaxies has proven to be very difficult. I have managed to successfully acquire color images of small planetary nebula with relatively high surface brightness. In recent years the trees in my yard have encroached on my observing location. This has also impacted my imaging opportunities.